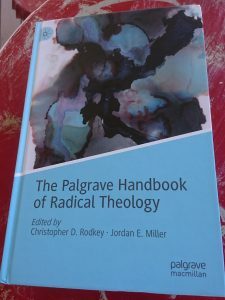 Review: The Palgrave Handbook of Radical Theology. Eds Christopher D Rodkey and Jordan E Miller. Palgrave Macmillan, 2018. It is difficult to know where to start when reviewing a 700 page handbook of theology that contains 27 articles on figures in the field and a further 24 articles on topics related to radical theology. Many of the articles on figures in the field contain sections on biography, major themes, critical and historical impact and starting points for someone wanting to go back to the original texts. I will be using this last section often in the months to come, as I have discovered so many new, (at least to me), interesting thinkers that I want to explore further. These include articles on James Luther Adams, Leslie Dewart, Charles H. Long, Richard L. Rubenstein and Dorothee Soelle. Of course, there were other articles on some of my favourite thinkers: Jack Caputo, Dietrich Bonhoeffer and Jacques Ellul (that was a surprise inclusion, but one of which I approve). There were articles on figures I think I agree with, but don’t quite understand, Catherine Keller, on figures I think I disagree with, but don’t quite understand Rene Girard, and on figures I definitely disagree with but don’t quite understand, Slavoj Zizek. The section on topics is broad and often surprising. Yet all articles were interesting and added to my understanding. The articles on the different religious traditions, Buddhism, Catholicism, Islam, Judaism, Orthodoxy were particularly useful and the article on Pentecostalism a stand out. Phil Snider’s article on Homiletics was excellent and a great companion to his recently edited book, Preaching as Resistance: Voices of Hope, Justice and Solidarity. Similarly, Keegan Osinski’s article on Liturgy gave much food for thought. As someone who has been heavily influenced by the work of Gutierrez, Segundo and Boff, I found the article on Liberation Theology particularly interesting and helped clarify how the “death of God” radical theologians are related to other “radical” theologies and practices. The colonial self is monolithic. But the indigenous culture it attempts to overcome is multiple and in that sense indestructible. … Seen from this point of view contemporary Australian culture is blasphemous. For in a sacred culture the world is not the creation of human history or technology but of unseen presences with whom we cooperate. Reality therefore is not closed in on itself. Everything holds together in a system of correspondences and resonances. However, perhaps I am being unfair. This is after all a handbook, a starting point, not an end point or the final source of all answers. It will be an invaluable aid for students and oldies like myself who are still learning. It gives a step up in understanding a complex area. I won’t suggest you rush out and buy a copy. Though worth every cent, it is too expensive for most individuals. Rather, harass your local library to purchase a copy. It will be borrowed regularly for the next 20 years. Len Baglow, Management Committee of APCVA. Veronica Brady, 2008. The God Shaped Hole. ATF Press, Adelaide. p.79.